You Soon Might Have To Remove Bull-bars From Your Car! The government’s Ministry of Highways and Road Transport (MORTH) has just banned bull-bars on cars and SUVs running on roads of India. The ministry has sent out a letter to the transport commissioners of all the states of the country, urging them to act against those vehicles running bull-bars. The ministry is urging to take the action as bull bars posed a danger to pedestrians as well as occupants, and were in violation of the Motor Vehicles Act. The Act prohibits owners from altering a motor vehicle in such a manner "that the particulars contained in the certificate of registration are at variance with those originally specified by the manufacturer". If this law got through, the ones not following it will attract a fine of Rs 1,000 for the first offence and Rs 2,000 subsequently. Thereby it's advisable that if you have a car or SUV equipped with a bull-bar/bull-guard, it is advisable that you get it removed at the earliest. Bull-bars/bull-guards may protect your vehicle’s bumpers from minor scrapes but they have multiple disadvantages, some of them very dangerous to your personal safety, and safety of fellow road users like cyclists, two wheeler riders and pedestrians. ShriramAutomall India Limited (SAMIL) hopes this blog to be of your help. For more such blogs, visit us at https://www.samil.in/. 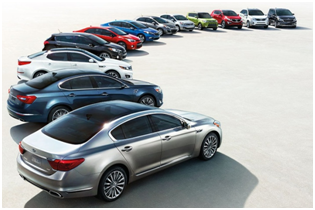 We are the largest used vehicle andequipment transaction platform in the country. So, with New Year approaching, if you are look to acquire used vehicle or equipment of any make and model, visit your nearby Shriram Automall today. We have 70+ well structured Automall facilities and 150+ bidding yards across the country. You can also register yourself or download our app from below links for more convenience and ease. Shriram Automall Transforming Young Future! 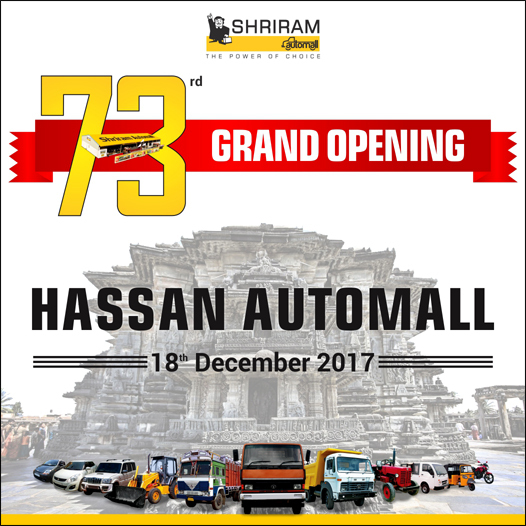 Keeping in mind the need for a skilled workforce in near future, Shriram Automall IndiaLimited (SAMIL) distributed 125+ Scholarship cheques during the inauguration event of its 73rd Automall in Hassan on 18th Dec 2017. Company understands that, thereby through such initiatives it aims to be a great motivating drive for the progress and development of students who do not have access to adequate financial resources for educational endeavors. 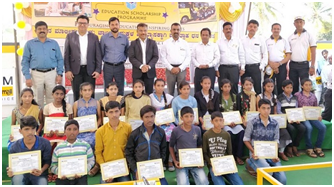 Cheques were distributed by SAMIL in association with Shriram Transport Finance Company (STFC) and Shriram Foundation distributed by Mr. Umesh Revankar, MD - STFC, Mr. Sameer Malhotra, CEO - SAMIL and Mr. Sudarshan B Holla, Zonal Business Head Karnataka – STFC. Without a doubt, event had a great impact on students, for them it changed in realms of education, as boosting their self-confidence; company very efficiently made them understand how they are the future driving force of the evolving India. Company being the No.1 platform for used vehicles and equipment transaction in the country, while anticipating its customer's requirements for used vehicles and equipment has made social responsibility its paradigm responsibility. Not just scholarships, company also understands the need of making country greener and cleaner. Thereby through 70+ Automall facilities spanning across India, company not only fulfill all type of used vehicles & equipment requirements of people but also promote “Plantation of trees”, by planting a tree on the inauguration day of the facility itself. Company has even installed, ETTPs (Effluent Treatment Plant) for pollution Control, so, that waste water which industries generate could be treated first, before its discharge in the environment. SAMIL as a company is taking all the essential steps, to make both its in office and outside office environment a better place to be in. You as a citizen should play your role as this good deed is not only for us, but for the generations yet to come. So, what are you waiting for? Plant more trees, encourage your children to pursue studies and to learn more about Shriram Automall, visit your nearby facility. Till then if you desire to acquire a used vehicle or equipment, visit SAMIL at https://www.samil.in/ to go through the vast inventory available. The Newly Amended Motor Vehicles Act Bill Will Change The Way India Drives This Winter! Motor vehicles including, automobiles was first introduced in India at the end of 19th century. And to regulate their use 1914 Act was the first to be codified which had 18 sections under it. Later, Motor Vehicles Act, 1988 was introduced which regulated all aspects of road transport vehicles including both transport and non-transport vehicles. The Act provides details of legislative provisions regarding licensing of drivers/conductors, registration of motor vehicles, control of motor vehicles through permits, special provisions relating to state transport undertakings, traffic regulation, insurance, liability, offences and penalties, etc. 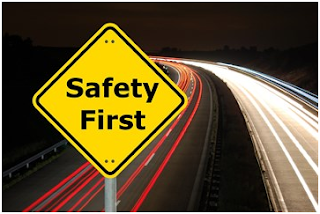 To exercise the above legislative provisions Government of India created Central Motor Vehicle Rules in 1989 and made sure that all the rules under the Act are enforced. With evolving times, government of India keeps updating these rules to provide on-road safety to the citizens of the country. Now, in winter 2017 The Motor Vehicle Act (Amendment) Bill 2017 proposes imposition of hefty penalties on auto companies which manufacture faulty vehicles. The Bill also seeks statuary guidelines for cab aggregators and a 10% annual increase in penalties for traffic rule violations. would help meet the UN mandate to reduce road accidents up to 50% by 2020. • Aadhaar will be mandatory for getting a driving license and vehicle registration. • For deaths in hit-and-run cases, the government will provide a compensation of Rs 2lakh or more to the victim's family. Currently, the amount is just Rs 25,000. • In traffic violations by juveniles, the guardians or owner of the vehicle would be held responsible unless they prove the offence was committed without their knowledge or they tried to prevent it. The registration of the motor vehicle in question will be cancelled and the juvenile will be tried under the Juvenile Justice Act. • The minimum fine for drunk driving has been increased from Rs 2,000 to Rs 10,000. • The fine for rash driving has been increased from Rs 1,000 to Rs 5,000. • The fine for over-speeding will go up from Rs 400 to Rs 1,000-2,000. • Not wearing seatbelt would attract a fine of Rs 1,000 as against Rs 100 at present. • Talking on a mobile phone while driving will attract a fine of Rs 5,000, up from Rs 1,000. 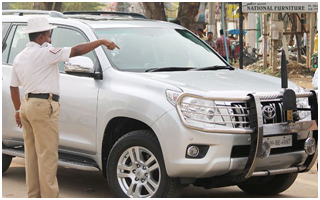 • It will be mandatory to alter vehicles to make them suitable for especially abled people. • Motor Vehicle Accident Fund will provide compulsory insurance cover to all road users in India for road accidents, fire as well as acid attacks. • Contractors, consultants and civic agencies will be accountable for faulty design, construction or poor maintenance of roads leading to accidents. • A time limit of six months has been specified for an application of compensation to the Claims Tribunal with regard to road accidents. • The Bill will remove the cap on liability for third-party insurance. The 2016 Bill had capped the maximum liability at Rs 10lakh in case of death and Rs 5lakh in case of grievous injury. So, let’s come together and help government to work towards the common vision. For more such updates and informative posts visit Shriram Automall India Limited(SAMIL) at https://www.samil.in/. While doing so you can also have a look at the best in class inventory of usedvehicles and equipment of every make and model, that company has to offer. 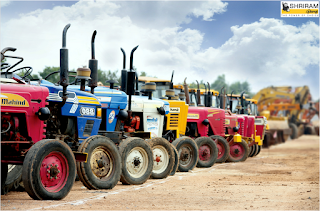 Why Shriram Automall is the OneStop Destination for Acquiring Used Tractors? The industry, which has recorded a steady performance in the current fiscal with a volume growth of 12.8 % during April-August FY18, is expected to end FY18 with a volume growth of 10-11 %. Today India’s gross cropped area is next to United States of America (USA) and Russia along with fragmented land holdings which have helped the country to become the Largest Tractor Market in the World. With everything getting advanced, Agriculture has also got advanced and one step ahead of what it used to be in the country. But, buying a new advanced vehicles & equipment can quite hamper a farmer’s budget as well as daily lifestyle. That’s why, Shriram Automall India Limited (SAMIL) has bought the vast range of used agricultural vehicles and equipment at optimal prices, for all kinds of farm demands. Company even gives interested buyers accessibility to come and inspect the vehicle of choice before participating in the bidding events along with the easy finance facility to make the process of acquisition both easy and affordable, with long term results. In spite, of having number of sources dealing in same segment SAMIL's customer oriented services and efficiently transparent bidding platforms have made the company no.1 choice of its customers. Customers all across the country rely on company's services and platforms for every type of used vehicle andequipment demand. As company not only anticipate its customers demand but also work toward fulfilling it, while helping customers decide the suitable usedtractor for themselves through proper inspection. 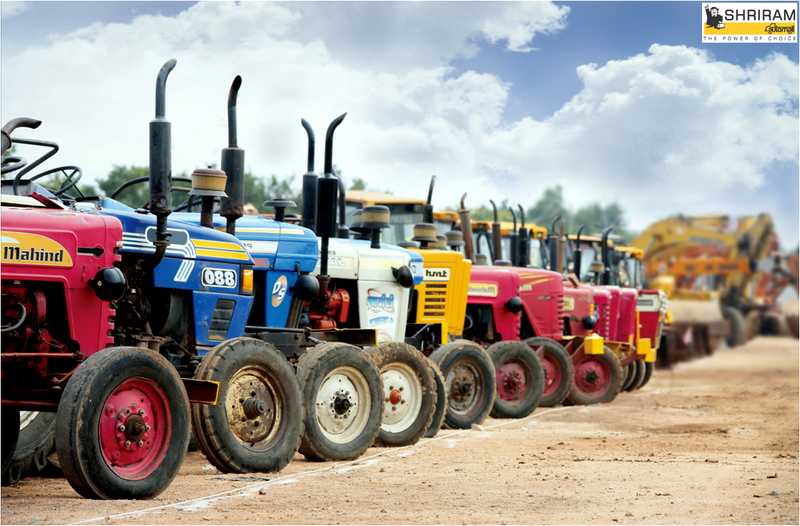 With these points in mind you are all good to go on your way to acquire your desired used tractor. So, if you as well are looking to buy or sell any sought of used vehicle and equipment SAMIL is your one stop trustworthy solution, which with transparent negotiable deals through different platforms will provide you the memorable customer experience. With always increasing amount of air pollution, Indian Government instituted some emission standards in 2000 known as “Bharat stage emission standards”. Progressively stringent norms have been rolled out since then. This info-graphic aim to represent the story of implemented emission norms till now in the country. Checklist to Acquire the Best Used Car for Every Demand! Nowadays, acquiring used car is considered a smart choice. As cars of today last long and thereby you can take benefit of them in a lot less money without getting worried about the depreciation in re-sale value. But before you do so, you must follow the checklist bought by Shriram Automall India Limited (SAMIL)- The No.1 Used Vehicle and Equipment Platform in the country, to acquire the best used vehicle of your choice, suiting your requirement. Shriram Automall Jaipur Completing 5 years of Existence! Spread in every nook and cranny of the country Shriram Automall India Limited (SAMIL) now have 70+ Automall Facilities and 150+ Bidding Locations in India. In 2011, company came into existence with an aim to organize the most unorganized used vehicle and equipment industry of the country. Since, then SAMIL has never looked back. 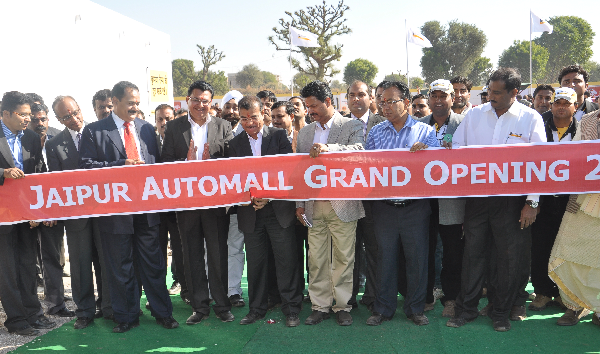 Among the 70+ well established Automalls, Jaipur Automall Facility was inaugurated on 19th December 2012. This year the Automall is completing 5 years of bringing convenience at the door steps of customers willing to acquire or dispose used vehicles and equipment in and nearby areas. 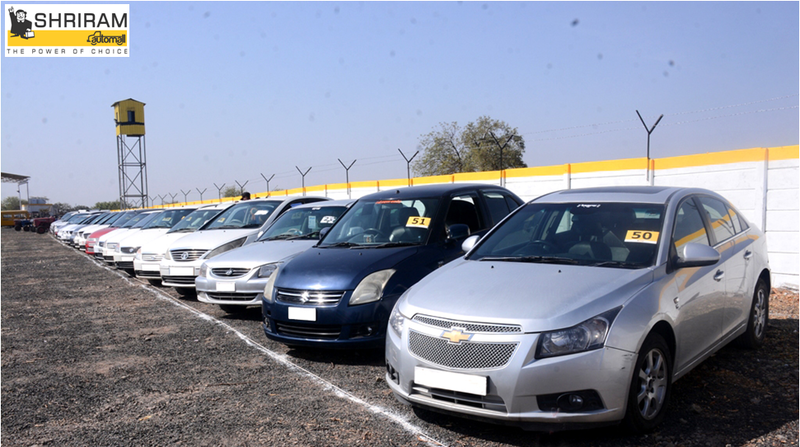 In the history of the state of Rajasthan, SAMIL's Jaipur Automall is still considered as the leading name for conducting most innovative bidding events for acquiring used vehicles and equipment. Thereby we can say that company has created a very well appreciated name for itself in the area. The Automall facility is further utilized for holding vehicle events periodically. 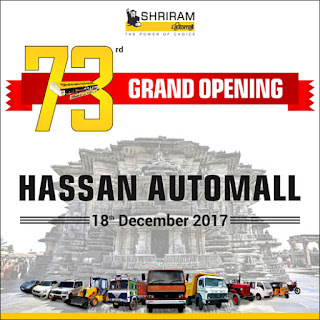 It also houses Shriram One Stop, a computerized touch screen kiosk which is a virtual Truck Bazaar, providing real time information about used commercial vehicles available in the inventory. Automall when inaugurated was the 15th facility across the country, now company has expanded its wings and with a long term vision soon aim to turn the number of 70+ Automalls into 100. Visit the Jaipur Automall on 19th December'2017, to participate in the Anniversary special bidding event to inspect the used vehicle of your choice and participate in the bidding event to acquire them. At the Automall you will also get complete assistance on financing and insurance options, as well as services for repair & refurbishing the vehicles. 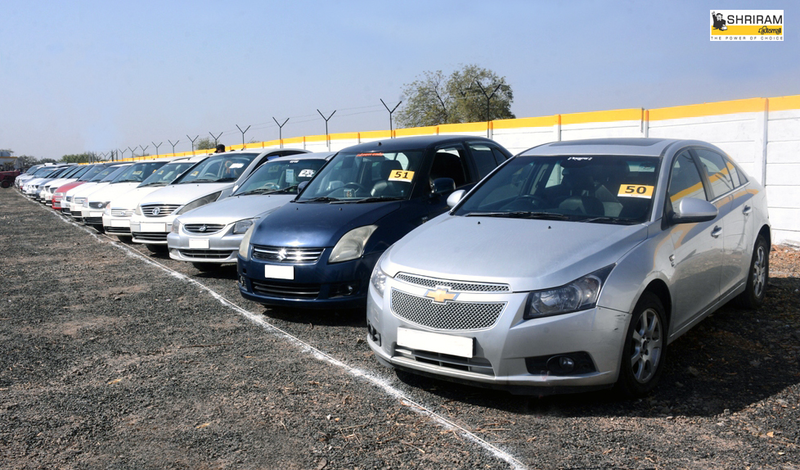 Shriram Automall - The No.1 Choice For Acquiring Desired Used Vehicles Among Youngsters! Today’s self efficient generation wants to drive the world on their own and having their own transport seems to give them ticket to their choice of life. As a beginner, young generation craves to be the owner of their own vehicles but definitely in a smart way i.e. they look forward to start their journey with a used vehicle rather than buying a new one. For most young people and their parents, buying the first car is quite a big step. As most teen drivers stand a greater risk of crashing, scratching than anyone else on the road, thereby acquiring a used two-wheeler or car for first time drivers is indeed the best and the smartest choice. Shriram Automall India Limited(SAMIL) being the leading platform for used vehicle and equipment transactions, while understanding the demand for used automotives in the country for every age and every job, make sure to provide the best in class range at optimal prices. This makes the company the No.1 choice not only in the industry but also among the youngsters, who look forward to visit company's Automall facilities to acquire their best in class first ride. After all company is best known for being India’s most trusted network provider with well structured Automall facilities serving most innovative bidding platforms and allied services, aiming to provide customers the life time experience. Not just that in addition, company while anticipating the customer demands way before, also serve the potential buyers through online mediums like MySAMILMobile App., Desktop Bidding, Online Bidding. These platforms comes in handy for everyone, but are majorly used by youngsters and working professionals, as by using these mediums they are able to learn all about the company's extensive inventory near them and scheduled upcoming bidding events. Company is in itself a complete solution provider for every type of used vehicle and equipment demand in the country and thereby is a most renowned name. So, what are you waiting for? 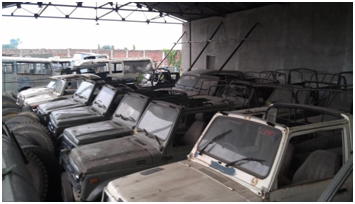 If you are a willing buyer or seller who want to acquire or dispose used vehicle or equipment of any and every make and model, SAMIL is your OneStop destination. Thereby don't think twice and click the link below to register yourself and download company's app. Old and Defunct Vehicles to Be Auctioned Off! In a joint drive with the municipal corporations, Delhi government’s transport department will soon auction the junked cars which have remained parked for years at one place. The drive will start from south Delhi and later all areas of the city will be targeted. The drives will be carried out by a joint team of the personnel and the respective civic body. To target the same and in addition to identify the diesel/petrol vehicles which have crossed their 10/15 years on road run, and are not allowed on the city roads anymore, government is now developing a software through National Informatics Centre (NIC) using which finding out whether a diesel-run vehicle is 10 years old or a petrol-run vehicle is 15-year-old will become easy and quick. Government is keen to take on the particular initiative as in Delhi, there are thousands of such junked vehicles lying around in the city that are not fit to be driven any more but yet is occupying premium parking space. Many of them don’t even have tyres and are supported by bricks. They particularly stand still just to occupy the parking space; sometimes people intentionally acquire them just to do the same. But now the time for such vehicles has come to an end, now the functional parking space will only be available for the vehicles which are functional. The department is also in the process of developing a mobile application through which common people will be able to help government, by clicking pictures of junked vehicles and share them along with the GPS location. This will improve the output of the drive taken for the cause, as this will help government to identify such vehicles and take action conveniently. Along with this to discourage misuse of prime space, transport department’s draft parking policy prescribe heavy parking charges for junked vehicles parked on streets. Shriram Automall India Limited(SAMIL), while playing its part in the national development will come forward and help government to dispose scrap and junk vehicles through its most innovative and transparent bidding platforms. So, let’s come together and help government in this initiative of making India, technologically advance and clean. While doing so, if you are looking forward to acquire or dispose used vehicle and equipment but have no time to visit your nearby Automall, register yourself simply by clicking the link below or by downloading company’s very own MySAMIL Mobile App. Shriram AutomallIndia Limited (SAMIL) on 13th December, 2012, launched its 13th Automall facility in Faizabad, Uttar Pradesh. The new Automall was inaugurated by Mr. Umesh G. Revankar (MD, STFC) and Mr. Sameer Malhotra (CEO, SAMIL). Currently company has expanded its reach in entire nation with well structured 70+ Automall facilities and 150+ bidding locations, sprawling in every minor and major city of the country. 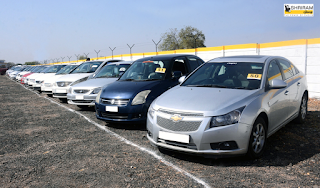 Faizabad Automall facility is sprawling in 4.6 acres of land. 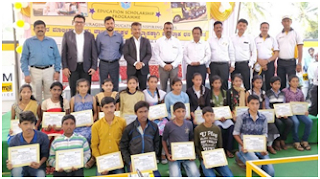 Further, the automobile fanatics seemed greatly enthralled when they were apprised by the online platform, along with various other auxiliary services like Finance, Insurance, New Look, Parking and Documentation. Since the introduction of this Automall, SAMIL has offered enhanced levels of customer support in the city. 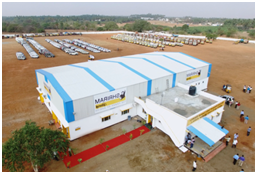 The facility spans across mammoth landscape providing innovative bidding platforms and plethora of services to the potentials sellers and buyers of usedvehicles and equipment in and nearby areas. It is manned by qualified, experienced and trained personnel offering best-in-class services. If you are an interested buyer or a seller of a used automotive or equipment, visit the Faizabad Automall, on 13th December’2017 and participate in the special bidding event to take home desired used vehicle of your choice. Considering modern cars are made to last for a long time, buying a used car can be a very smart decision. In fact you can get more out of the used car than from the new one, though it can be a rather intimidating experience for both, buyers as well as sellers. Thereby Shriram Automall India Limited (SAMIL), through its most innovatively transparent bidding platforms aims to make the process convenient and optimal, so that both buyers and sellers could get most out of the deal. Addition to the services company offers, here is a blog providing you the checklist which can simplify matters, reduce risk, and convert the used vehicle transaction into a hassle-free affair. While following the above buyer’s and seller’s checklist you can help yourself from being troubled after the deal is closed. 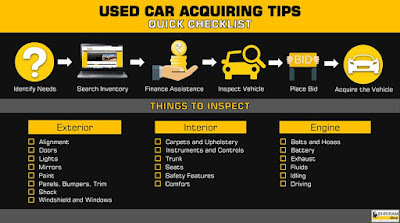 Now, below is the checklist following which you can decide whether or not the vehicle you are acquiring is fit for you. • Go for a test drive. • Perform a leak test. • Check the hoses and belts. • Inspect the engine for any sort of leaks, or corrosion. • Remove the oil filler cap. As foam residue on the inside indicates a leaking head gasket. • Pull the transmission dipstick; the fluid should be pink or red. • Check the timing belt. • Have a mechanic inspect the vehicle. • Make sure that the car is on level ground before checking it out. • Carefully check the paint job of the car, taking note of any rust spots, dents or scratches. • Check the trunk of the car to make sure it is still in good condition. • Never buy a frame damaged car. • Try to get under the car when it is safely raised and inspect the exhaust system or any under-body rust. • Check under the hood of the car for any indication of dents, damage or rust. • Go inside the car. Check the seats and upholstery of the car for any tears, rips, stains, or other type of damage. • Check to make sure the air-conditioning of the car is working well by turning it on. • Check the odometer of the car for the mileage. • Find out if the car has a computer on board. • Verify the lights and all the regular functions of the car when not moving. This includes: any sensors for parking, back parking camera, radio, CD, music installation, etc. 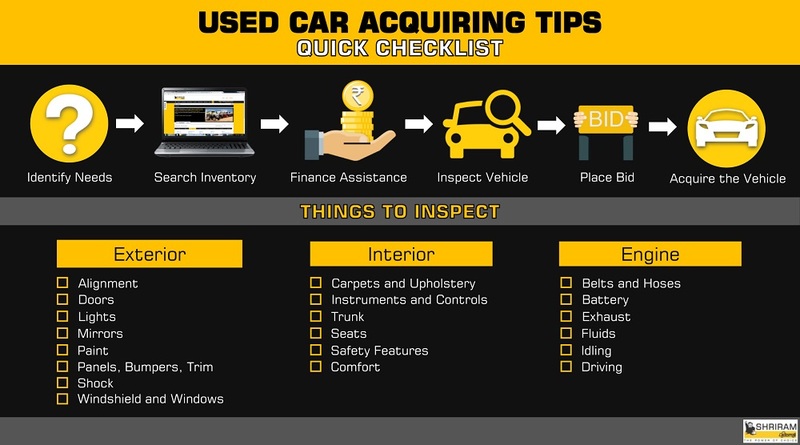 Keep in mind, these checklist pointers goes for acquiring and disposing all type of used vehicles and equipment. For more such information you can click the link below and go through our blog posts and at the same time to acquire or dispose a used vehicle or equipment you can register yourself by clicking the link. After a decline in the past three years, the light commercial vehicle segment (LCV), consisting of the sub 3.5 tone vehicles, has resumed its strong growth. The factors that aided the demand for the segment were growth in replacement demand, improved financing and recovery in rural demand. Also, through increased thrust on infrastructure and rural sectors in the recent Budget, potential implementation of fleet modernization or Scrappage program and higher demand from consumption-driven sectors, especially for LCVs and intermediate commercial vehicles (ICVs), commercial vehicles have found their momentum back. Further investments in e-commerce segment are driving demand for last mile transportation requirements and accordingly light commercial vehicles. These factors along with the favorable monsoon and a better crop harvest have supported demand recovery from the rural areas as well, which is a fairly sizeable market for small trucks. The SCV segment is expected to grow in the range of 14-16 per cent in volume terms in the current fiscal. During April-October 2017 period, total LCV sales grew by 19% at 218,602 units as compared to 183,611 units in April-October 2016. In the same, mini-trucks (Tata Ace segment) grew by 22% at 80,150 units (65,700 units), while pick-ups (above 1-tonne payload vehicles) reported a growth of 17% at 138,452 units (117,911 units). Since ratio of used commercial vehicles to that of the new commercial vehicles is 1:1. 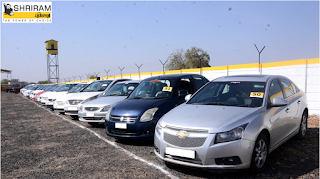 Shriram Automall IndiaLimited (SAMIL) the No.1 Used Vehicle and Equipment Provider in India is witnessing a robust demand for used light commercial vehicle as well. While providing deals for every pocket, company anticipate its customers demand and serve them the best. So what are you waiting for? With easy finance facility along with other customer oriented services, acquire your dream light commercial vehicle now!